Updated at 11:42 a.m. on 4/28/15 to reflect that the inmate died Tuesday. An inmate from the Southern State Correctional Facility in Springfield died Tuesday, five days after hanging himself inside the prison, the Vermont Department of Corrections said. 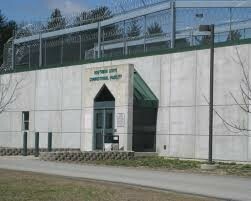 Southern State Correctional Facility in Springfield, Vt.
Patrick Fennessey, 32, had been hospitalized at Dartmouth-Hitchcock Medical Center in Lebanon, N.H., since April 23, DOC Commissioner Andy Pallito said. Fennseesy was serving a two-to-10-year sentence for burglary and unlawful trespass. His maximum release date is in 2019. His minimum passed in 2011. Pallito said the incident has been referred to Vermont State Police. There are no indications of foul play, Pallito said. It has also been referred to the investigations unit of the Agency of Human Services, which can review any potential personnel problems inside the state's largest prison, and the Defender General's Office. Fennessey was in general population and had a cellmate, the DOC said. He was not subject to checks given every 15 minutes for inmates believed to be suicide risks, Pallito said. The news comes several months after the family of a Winooski man who hanged himself in a state prison in 2013 sued the DOC. The lawsuit alleges that DOC staff drove Robert Mossey, 38, to suicide by failing to monitor him after prescribing medication with psychological side effects, and by letting him languish in custody weeks after he could have been released. Mossey hanged himself in a broom closet at Northwest State Correctional Facility in Newport in August 2013, three months after he began serving a sentence for retail theft.